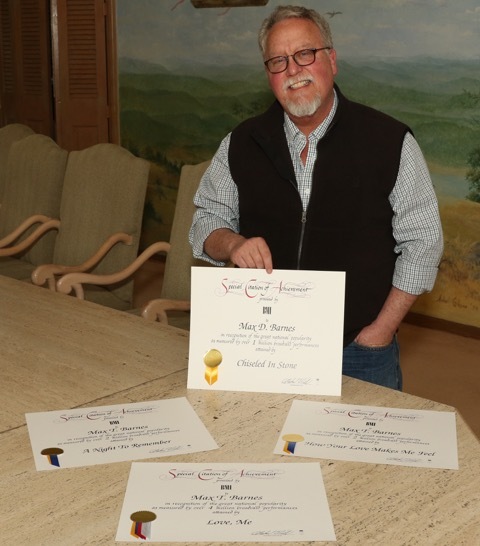 Max T. Barnes was recently presented with four Million-Air Awards from BMI, including one for his late father, Max D. Barnes, whose “Chiseled In Stone” reached one million broadcasts. Max T. Barnes’ “A Night To Remember” and “How Your Love Makes Me Feel” have both received two million radio spins, while “Love, Me,” recorded by Collin Raye, has garnered four million radio plays. The Million-Air Awards are given to songwriters, composers and publishers whose songs accumulate more than one million U.S. broadcast performances.